A mass driver or electromagnetic catapult is a proposed method of non-rocket spacelaunch that would use a linear motor to accelerate and catapult payloads up to high speeds. All existing and contemplated mass drivers use coils of wire energized by electricity to make electromagnets. Sequential firing of a row of electromagnets accelerates the payload along a path. After leaving the path, the payload continues to move due to inertia. A mass driver is essentially a coilgun that magnetically accelerates a package consisting of a magnetisable holder containing a payload. Once the payload has been accelerated, the two separate, and the holder is slowed and recycled for another payload. Mass drivers can be used to propel spacecraft in two different ways: A large, ground-based mass driver could be used to launch spacecraft away from the Earth or another planet. A spacecraft could have a mass driver on board, flinging large pieces of material into space to propel itself. A hybrid design is also possible (see coilgun, railgun, or helical railgun). Miniaturized mass drivers can also be used as weapons in a similar manner as classic firearms or cannon using chemical combustion. Generally speaking, mass drivers are only practical for small objects at a few kilometers per second; for example 1 kg at 2.5km/s. Heavier objects go proportionally more slowly; and lighter objects may be projected at 20km/s or more. The limits are generally the cost of the silicon to switch the current and the cost of the power supply and temporary energy storage for it. Earth-based Mass drivers for propelling one-tonne vehicles to orbit are unlikely to be cost effective in the near future. The Earth's strong gravity and thick atmosphere make such an installation difficult, so many proposals have been put forward to install mass drivers on the moon where the lower gravity and lack of atmosphere significantly reduce the required velocity to reach lunar orbit. Most serious mass driver designs use superconducting coils to achieve reasonable energetic efficiency (approximately 50%). The best known performance occurs with an aluminum coil as the payload. The coils of the mass-driver induce eddy-currents in the payload's coil, and then act on the resulting magnetic field. There are two sections of a mass-driver. The maximum acceleration part spaces the coils at constant distances, and synchronize the coil currents to the bucket. In this section, the acceleration increases as the velocity increases, up to the maximum that the bucket can take. After that, the constant acceleration region begins. This region spaces the coils at increasing distances to give a fixed amount of velocity increase per unit of time. 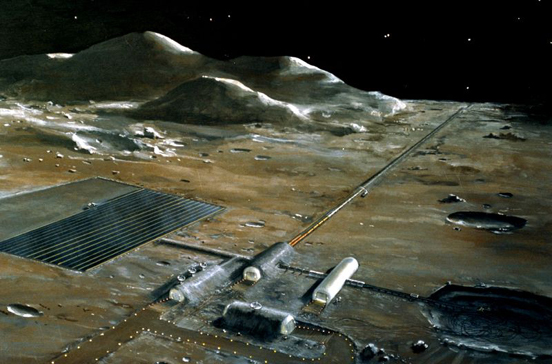 In this mode, the major proposal for use of mass-drivers was to transport lunar surface material to space habitats so that it could be processed using solar energy. The Space Studies Institute showed that this application was reasonably practical. In the prototypes, the payload would be held in a bucket and then released, so that the bucket can be decelerated and reused. A disposable bucket, on the other hand, would avail acceleration along the whole track. In contrast to a space gun, a mass driver can have a length of hundreds of kilometers and therefore achieve acceleration without excessive g forces to the passengers. It can be constructed as a very long and mainly horizontally aligned launch track for spacelaunch, targeted upwards at the end, partly by bending of the track upwards and partly by Earth's curvature in the other direction. Natural elevations, such as mountains, may facilitate the construction of the distal, upwardly targeted part. The higher up the track terminates, the less resistance from the atmosphere the launched object will receive. By being mainly located slightly above, on or beneath the ground, a mass driver may be easier to maintain compared with many other structures of non-rocket spacelaunch. If not underground then it still needs to be housed in a pipe that is constantly vacuum pumped in order to reduce drag. In order to be able to launch humans and delicate instruments, it would need to be several hundreds of kilometres long. For rugged objects, with magnetic assistance, a significantly smaller, circular, track may suffice. A mass driver on Earth would be a compromise system. A mass driver would accelerate a payload up to some high speed which is not high enough for orbit. It would then release the payload, which completes the launch with rockets. This would drastically reduce the amount of velocity needed to be provided by rockets to reach orbit. On Earth, a mass driver design could possibly use well-tested maglev components. A spacecraft could carry a mass driver as its primary engine. With a suitable source of electrical power (probably a nuclear reactor) the spaceship could then use the mass driver to accelerate pieces of matter of almost any sort, boosting itself in the opposite direction. At the smallest scale of reaction mass, this type of drive is called an ion thruster. Since current linear motors can accelerate cargo to 30 km/s, an engine using one would have a specific impulse of about 30 km/s or 3,000 s. No theoretical limit is known for the size, acceleration or muzzle energy of linear motors. However, at higher muzzle velocities, energetic efficiency is inevitably very poor. While linear motors can, with current technology, convert up to about 50% of the electrical energy into kinetic energy of the projectile, the energy of interest is the kinetic energy of the vehicle, and as the muzzle velocity increases, this is a smaller and smaller percentage of the generated power. Since kinetic energy of the projectile is ½mv², the energy requirements vary with the square of the specific impulse, so in a design one must choose a tradeoff between energy consumption and consumption of reaction mass. In addition, since momentum of a particle of mass m has momentum mv- proportional to velocity, but energy is a square law, so the average thrust for a given energy is inversely proportional to the velocity of the particles. In other words, heavier projectile masses give lower specific impulse but proportionately higher thrust. (See propulsive efficiency for more details). Since a mass driver could use any type of mass for reaction mass to move the spacecraft, this, or some variation, seems ideal for deep-space vehicles that scavenge reaction mass from found resources. One possible drawback of the mass driver is that it has the potential to send solid reaction mass travelling at dangerously high relative speeds into useful orbits and traffic lanes. To overcome this problem, most schemes plan to throw finely-divided dust. Alternately, liquid oxygen could be used as reaction mass, which upon release would boil down to its molecular state. Propelling the reaction mass to solar escape velocity is another way to ensure that it will not remain a hazard. Space is almost completely empty, so propellant sources are only to be found at asteroids, comets, moons and planets. Another variation is to have a mass-driver on a spacecraft, and use it to "reflect" masses from a stationary mass-driver. Each deceleration and acceleration of the mass contributes to the momentum of the spacecraft. The spacecraft need not carry reaction mass, and doesn't even need much electricity, beyond the amount needed to replace losses in the electronics. The system could also be used to deliver pellets of fuel to the spacecraft for use in powering some other propulsion system. This could be considered a form of beam-powered propulsion. Another theoretical use for this concept of propulsion can be found in space fountains, a system in which a continuous stream of pellets in a circular track hold up a tall (and heavy) structure. High-acceleration linear motors are currently undergoing active research by the military for use as (ground-based) armor-piercing weapons. Since a mass driver is essentially a very large, very high-velocity linear motor, it could in principle be used as a very large weapon, either firing directly on a target in space, or used to attack a location on a planet's surface from a position in orbit, long range over-the-horizon indirect fire, or from a nearby planetary body, such as a moon. Prototype mass drivers have existed since 1976 (Mass Driver 1). Most were constructed by the US Space Studies Institute in order to prove their properties and practicality. Electromagnetic Guns - A page describing research into linear motors at MIT. New Scientist: Huge 'launch ring' to fling satellites into orbit - October 2006 article about research into a circular mass driver.